The introduction of this new model. 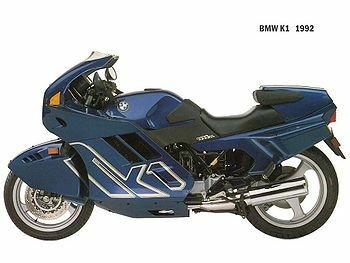 with its totally innovative appearance, caused a sensation, particularly since it came from BMW, normally so careful to respect its own design traditions, The astounding K1 under development since 1983 and unveiled in 1988 -was the result of BMW's constant research program. The classical styling of their models often incorporated carefully studied aerodynamics's, but in the extreme case of the K1, BMW; chose to ignore both current fashion and the conservative taste of their traditional clients, BMW would be guided by the functional standards dictated by wind-tunnel studies. The K1 was the final descendant in a long line that went back to Ernest Henne's streamlined record-breakers of the Thirties (174 mph in 1937) through the R100RS of 1976. The new model utilized the existing K100 four cylinder engine, but added four valves per cylinder and twin cams working directly on bucket tappets together with a digital Motronic engine management system to the mix. The result was 100bhp at 8,000rpm, the then voluntarily imposed bhp limit for machines in Germany. In itself 100bhp was impressive but it would not deliver the performance required to elevate the machine to the "top table". In order to achieve this BMW looked to the models aerodynamics. BMW were aware that the aerodynamic drag of a motorcycle represented a ceiling that was hard to break, beyond a certain point vast increase in power achieved little in terms of increased performance unless the air flow was "cleaned up" and conversely better aerodynamics could offset lower brake horsepower figures. The large all enveloping from mudguard, seven piece fairing and large tail unit that emerged as a result of the quest for aerodynamic efficiency not only endowed the machine with a striking appearance but resulted in a drag coefficient of 0.34 with the rider prone, at the time the lowest figure for any production motorcycle and one which, in combination with the 100bhp available resulted in a top speed approaching 160mph and a 0 to 60 time of 3.3 seconds. Brembo brakes, partnered by an ABS system, Marzocchi forks measuring 41.7mm and a paralever suspension system adapted from that employed by the GS series machines ensured that the new model handled with a precision not normally associated with the marques products, whilst practical touches, such as the integrated "panniers" and pillion seat cover added to the motorcycles appeal. The result was undoubtedly the finest handling and fastest BMW production motorcycle built, and served to highlight BMW's technological ability, however, the company's compliance with the voluntary 100bhp limit combined with a dry weight 234kg conspired against it. The result was arguably the finest "sports tourer" available, not an outright sports bike, which, together with a high showroom price resulted in only 6,600 being manufactured during the models five year production life. Exhibiting a sculpted look, the K1 sported a streamlined front tire and, in wind-tunnel tests, recorded a record low drag coefficient of 0.34, The maximum speed benefited considerably: the K1 could achieve almost 150 mph on just 100 hp. A pure sporting machine, the K1 was more of a grand tourer than the replica racers the Japanese loved.It could comfortably carry a passenger, had built-in luggage lockers, and even offered 250 cubic inch baggage compartments as an option. This page was last edited on 20 January 2011, at 19:24.